Previously, on Transposing the Matrix: If you recall, just over two weeks ago I had an auto accident resulting in my 2006 Toyota Matrix being totaled. Friday, we began the search for a new car. That post detailed some of the requirements for any replacement vehicle: cargo capacity, not too big, being able to work with my iPod Transpod, convenient Aux jack, backup camera, decent gas mileage. In Update 1, we had narrowed the field to three contenders: : the 2016 Scion iM [brochure], the 2016 Honda Fit, and the the 2016 Subaru Impreza 5-Door. In our most recent update, we had narrowed the field even further, to the the 2016 Scion iM [brochure] and the 2016 Subaru Impreza 5-Door. The two cars were very closely matched on specifications, often matched to within inches of each other. The prices were also very close to each other, especially when the Costco Buying Service came into play. If you’ve ever had a black interior in the summer in the valley, you know the problem with that. I was tired of all the silver, grey, and white cars out there, and would not go for black or red, and so I chose a lovely green. 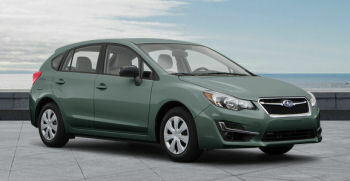 Hence, it has been named the “Big Green Subaru” (although really it is a baby Subaru) — the car for a Road Scholar. Financing has been straightened out, insurance has been updated, and there is just some final DMV paperwork to do. I’ve been asked how does it drive. Repeatedly. By Michael, who is living through this purchase because Target was out of lives :-). The answer is: I don’t really know yet. I’m on a vanpool, and have only driven it home and around the block to vote yesterday. I’ll do some more driving this weekend. From what I have driven, it is very smooth and quiet. I’ve acquired a CD-mount cell phone holder and a 30-pin line out cable, and have mounted the iPod off the CD holder. The only problem is that it slightly blocks the backup camera, so I take it off when backing up. Most of the other electronics are working well — I’ve already paired my phone with the car, but haven’t tested it for calls. I still need to get the Homelink buttons on the mirror to work with the garage door opener, but I’ll figure that out. It could just be that our garage door opener is too old. So, our Matrix has been transposed into an Impreza. All that remains is transferring my license plate. So, if you see a Green Impreza with the license plate shown to the right, give a wave. It is your friendly highway guy, probably on the way to see some theatre.